Today’s podcasts is from the audio book edition of my novel, The Genesis Generation. It consists of a reading of Chapter 9, Catlin’s Salon. This is a fictional account of what was once the most fashionable psychedelic salon on the West Coast. Once each month, for more than eight years, an amazing group of people would gather to discuss a mind-numbing array of topics. And while the story line in my novel is obviously fictional, the backdrop of the salon itself is described as best I can . . . and as best that I now remember, looking back after so many years that have passed since those wondrous meetings of the L.A. Chapter of the Albert Hofmann Society. Posted in Books, Consciousness, Culture, Death, Future, Genesis Generation, Imagination, Lorenzo, Science & Technology, Zoe7. I thought the same. Most happy to see you’re still with us Lorenzo!!! Very sad about Zoe 7 though. He was definitely one of the most interesting and unique voices out there, and he died so young. Its pretty shocking. 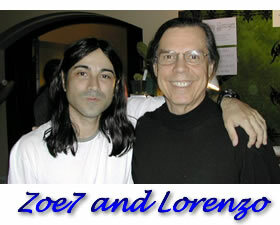 Rest in Peace, Zoe7 and Dr. Sewell. My heart skipped a beat when I saw this: A heading that reads “Two Friends we’ve recently lost” directly above a picture of Zoe7 and LORENZO. After looking it over I realized to my relief that you are, in fact, NOT dead, but you may consider reformatting this post as it is a bit misleading. Thanks again for all of the great material and still being alive!